Sirmoor Rifles Association – "Better to die than be a coward"
Welcome to the website of 2nd King Edward VII’s Own Goorkhas (The Sirmoor Rifles) and its regimental association, The Sirmoor Rifles Association (SRA). 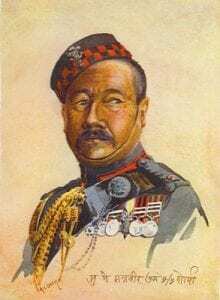 The 2nd King Edward VII’s Own Gurkha Rifles (The Sirmoor Rifles) was an infantry regiment of the British Indian Army before being transferred to the British Army on India’s independence in 1947. The 4th Battalion joined the Indian Army as the 5th Battalion, 8th Gurkha Rifles (Sirmoor Rifles), where it exists to this day. As part of the British Army, the regiment served in Malaya, Hong Kong and Brunei until 1994 when the regiment was amalgamated with the other three British Army Gurkha regiments to form the Royal Gurkha Rifles. It is the only Gurkha regiment which did not have Kukri on its cap badge. Please note that access to the SRA (Sirmoor Club) Members’ Secure Area is restricted to Members of the SRA (Sirmoor Club). If you belong to the Sirmoor Club as a paid-up member and do not have an ID/Password or have forgotten your password then please contact the Sirmoor Rifles Honorary Secretary who will arrange for a new one to be set up. Most recent Sirmoor Club Notices. Copywright: 2nd King Edward VII's Own Goorkhas - The Sirmoor Rifles Regimental Association.